Nothing is can affect your day worse than waking up, walking very zombie like to the bathroom mirror and seeing a big spot to great your morning. I’ve been having this a lot with the extra hormones taking over my body. I’ve never really been one to stick to a skincare routine. I always forgot or just couldn’t be bothered. I know thats so bad, but I’ve changed! I wanted to start with something quite natural that wouldn’t break the bank. 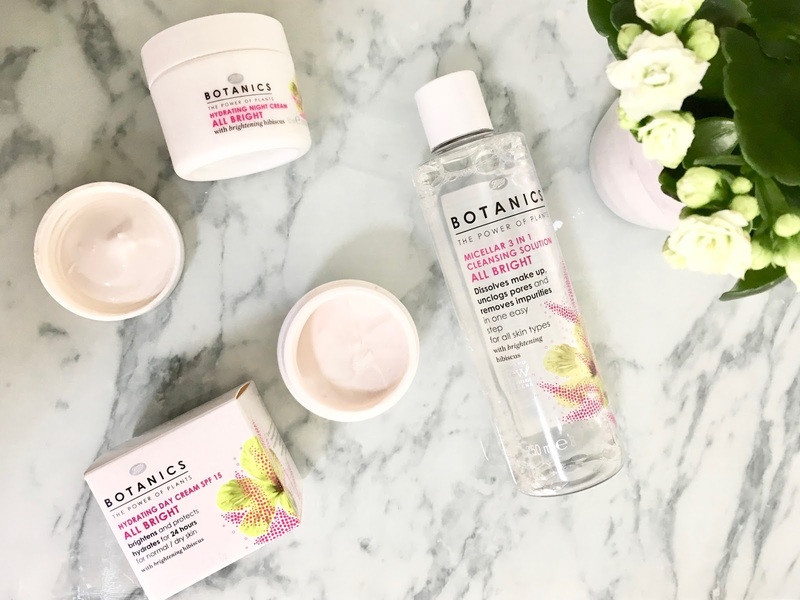 I have used the Boots Botanics range before but went shopping and picked up these 3 items. I started with what I felt were the basics, this is my own opinion though, I know everyones skincare routine is different. I brought the Hydrating All Bright Day Cream and Night cream, these are only £2.50 and on a BOGOFF offer at the moment. I then picked up the Micellar All Bright 3 in 1 cleansing solution, again it’s a steal at only £4. I was using the Garnier one before but found it dried my skin out a lot more making it worse. I am looking to expand my range now, still keeping with the botanics all bright as I have such dry skin, it’s made the world of difference. They have a serum which I am dying to try so that will definitely be my next purchase. I highly recommend this for anyone starting out in skincare or who just wants to go back to basics. Whats your favourite skincare item? Let me know in the comments below. Ooo I love the Botanic bath & body range in Boots but I've still not tried the skin care range. It's so hard to find good skincare, especially show when your hormones are all over the place!